WINNER of 2012 San Francisco Book Festival Award, Spirituality Category! BEYOND THE PEWS is making a splash all across the country. Everywhere author Jillian Maas Backman presents “Conversation with Jillian” readers are in awe of her down to earth attitude and humor. An interactive biography, BEYOND THE PEWS takes readers step by step into another dimension of their spiritual path. Jillian shares the personal account of her journey from spiritual innocence into a religious wilderness where she often hid behind her father’s powerful preacher’s robe. For many years she hoped her intuitive gifts would simply go away, but they never did. “I remained reclusive within the untainted spirit world until I became comfortable with my spiritual individuality and emerged from the sacred shadows into the awakened light of day.” Jillian eventually she learned to embrace the duality of her traditional religious upbringing and her connection with uncensored, untainted spirit. After years of processing these faith-based sensory perceptions, she discovered the soul’s natural intuitive language. Award-winning radio personality and Intuitive Consultant Jillian Maas Backman teaches valuable lessons for you to connect with your personal spiritual intuition and remove obstacles keeping you from living a fulfilled life. Interactive sections offer soul lessons to help you understand your own faith experiences and natural intuitive talents. 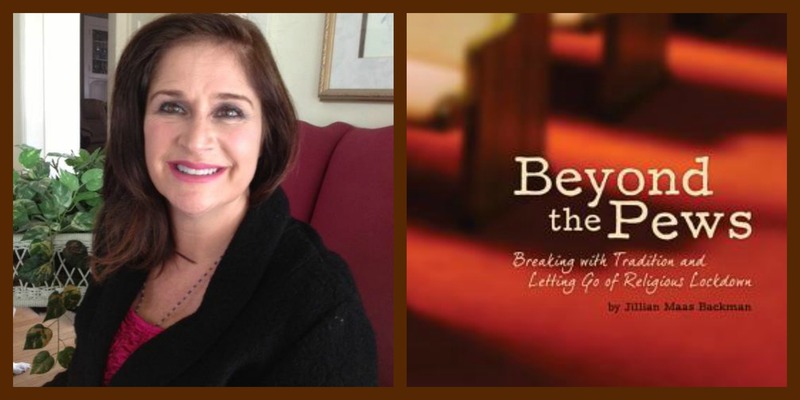 Beyond the Pews offers valuable ways for you to connect with your spiritual intuition. Interactive sections offer soul lessons to help you understand your own faith experiences and natural intuitive talents. Explore ways to Chart your Divine Energy Rhythm, find the difference in Art of Doing versus the Art of Being, and learn how to analyze colors seen. This extraordinary book guides you to a deeper awareness of a constant loving presence in your lives, and enables you to grow from a religious, dogmatic cocoon into an active, awakened being. What a special gift Jillian appears to have… Kudos to her for her multiple successes! And.. more kudos to Imagine Publicity for a very engaging read and striking graphics! You’ve done it again! Next PostShattered Lives: Sheryl McCollum Returns!